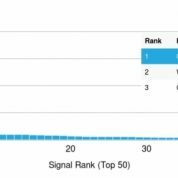 Glypican-3 (GPC3) is a glycosylphospatidyl inositol-anchored membrane protein, which may also be found in a secreted form. 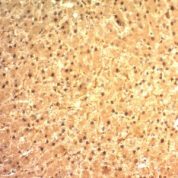 Anti-GPC3 has been identified as a useful tumor marker for the diagnosis of hepatocellular carcinoma (HCC), hepatoblastoma, melanoma, testicular germ cell tumors, and Wilm s tumor. In patients with HCC, GPC3 is overexpressed in neoplastic liver tissue and elevated in serum, but is undetectable in normal liver, benign liver, and the serum of healthy donors. GPC3 expression is also found to be higher in HCC liver tissue than in cirrhotic liver or liver with focal lesions such as dysplastic nodules and areas of hepatic adenoma (HA) with malignant transformation. In the context of testicular germ cell tumors, GPC3 expression is up regulated in certain histologic subtypes, specifically yolk sac tumors and choriocarcinoma. 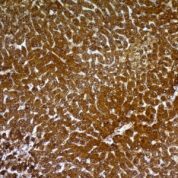 A high level of GPC3 expression is also found in some types of embryonal tumors, such as Wilm s tumor and hepatoblastoma, with a low or undetectable expression in normal adjacent tissue. In patients with thyroid cancer, expression of GPC3 is dramatically enhanced in certain types of cancers: 100% in follicular carcinoma and 70% in papillary carcinoma. Expression of GPC3 in follicular carcinoma is significantly higher than that of follicular adenoma. 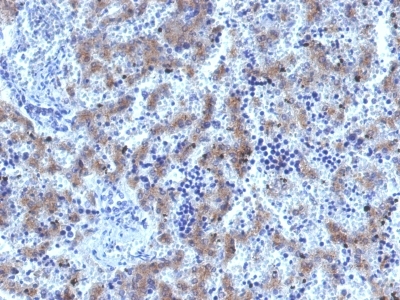 In contrast, GPC3 is not expressed in anaplastic carcinoma. Buffer and Stabilizer: 10mM PBS with or without 0.05% BSA & 0.05% azide. 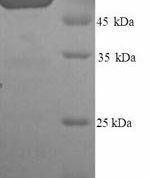 Anti-GPC3 antibody staining is expected to be primarily localized to the plasma membrane. enQuire Bio's Glypican-3 Recombinant Monoclonal is available for Research Use Only. This antibody is guaranteed to work for a period of two years when properly stored.